Only living things can reproduce. The making of a new plant or an animal is called reproduction. Plants and animals reproduce by making same kinds of copies of themselves. These same kinds of copies can be new plants, babies, kids or youngsters. Why do plants and animals need reproduction? To make sure that their species survive on Earth. To make sure that their species do not extinct. 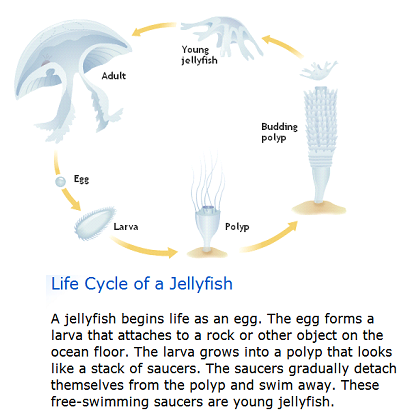 What is a ‘life cycle’? A life cycle is a series of stages a plant or an animal goes through from when it is first formed to when it dies. The life cycle of a plant or animal happens over and over again. A life cycle can be drawn in a circle. A frog’s life is divided into two main stages. 1) A tadpole hatches from eggs. 2) The tadpole breathes underwater through gills and swims like a fish. 1) The tadpole’s body changes shape. 2) Back legs and jaws are formed. 3) Front legs and lungs are formed for jumping on land and for breathing. 4) Now the tadpole becomes an adult frog. A caterpillar develops within the egg and then eats its way out of the shell. When the caterpillar reaches its final size it stops feeding. The caterpillar wriggles and twists to gradually remove its old skin, revealing a new protective skin called the pupa or cocoon. Inside the pupa, the caterpillar changes from a wormlike creature into an adult butterfly. When the butterfly reaches adulthood, it leaves the pupa. It pumps blood into its wrinkled wings and expands them to their full size before flying away.